high definition content with excellent performance! * Included Single and Dual Layer. ** All write speeds are “Maximum” speed. • Supports Dual video output that can be connect to LCD, HDTV, TV and CRT. • Excellent performance with full 1080p high definition video playback ability. • 5.1 channel High definition audio output. • Supports Socket P Intel® Core™ 2 Duo (Penryn) and Celeron™ CPU with 667/800/1066MHz FSB. • Intel® GM45+ICH9M chipset with GMA X4500MHD graphics engine, supports Microsoft® DirectX™ 10. • Supports dual channel SO-DIMM DDR-II 667/800MHz memory up to 4GB. 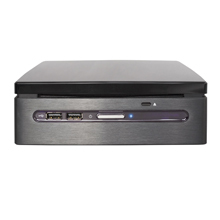 • Built-in highly performance H.264 video decoder. *HDMI connects provided by DVI to HDMI converter included audio signal. Note : * Max hardware structure. System will not detected to 4GB due to chipset limitation. Note 1 : The IR/Remote Control of AOpen accessory is not supported under Windows XP and Windows XP MCE. Note 2 : According to Intel chipset driver limitation, the Blu-ray is not supported under Windows XP and Windows XP MCE.